Today I'm showing a card that combines two of my favourite elements: Copic and crochet. This card actually grew in my head for a few hours and kept me awake out of my usual time for a few nights before I saw it finished. But I am very happy with the final result. And I hope it inspires you to come and join our challenge at Copic Spain, Anything goes with Copic. In this card: Digital stamp from Mo's Digital Pencil. White and dark blue card, computer printed sentiment, crochet snowflakes, rinestone, stickles, distress inks and embossing enamels. Snoflakes crocheted by me following this instructions, more or less. Wow! You've made me want to learn to crochet! This is absolutely beautiful! 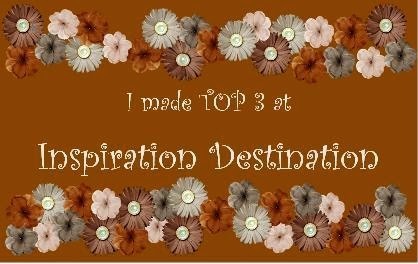 Thanks for sharing your fabulous project and joining our current challenge at Inspiration Destination. Hope to see you again and good luck! Buenos días Aurora; super bonita, me encanta el digi, cómo lo has coloreado y el curro que te has pegado con el ganchillo. Lovely creation! Those crochet snowflakes are perfect!! Lovely card. Thanks for joining us at Card Mania Challenges again. Good luck and hope you'll join us again.